The arrival of the railroad and the subsequent rapid growth of the new town of Burke required building materials, and by 1885 Burke had three sawmills. These mills probably provided crossties for the railroad and lumber for construction of houses and stores. The Burke Lumber Company was founded and operated by Thomas and Sallie Treadwell, who arrived in Burke in 1886 when they bought a lot from Harvey Belote. In 1891 Thomas J. and wife Sarah. J. (Sallie) Treadwell purchased blocks in the Antonio Chevans grant to the south along the tracks of the Houston East and West Texas Railroad. It was here in 1891 or 92 that they built their steam-powered sawmill, which operated as Burke Lumber Company. It was mentioned in the Galveston Weekly News in 1893 as cutting 20,000 board feet of lumber per day. The "Land of the Little Angel" recorded that Burke Lumber Company had been cutting at Chambers, Vaughn, and Belote between 1886 and 1895. The sawmill was located at the intersection of current County Roads 62 (Ryan's Chapel Road) and 62a (Railroad Street), and it probably operated into the 1920s. Besides the mill, the Treadwells owned a company storehouse and general mercantile in Burke, located just opposite and east of the Houston East and West Texas depot. 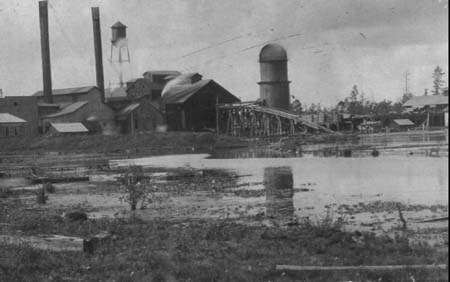 By 1915, no sawmills existed at Burke, which then had a population of 200, but the Burke Lumber Company mill possibly operated into the 1920s, since records show that T.J. Treadwell sold Burke Lumber Company lands, including mention of a mill, to Southern Pine Lumber Company sometime between May 21, 1923 and June 25, 1923. No record of the existence of a planer or of a company tram road exists. Burke pioneer Harvey Belote ran a sawmill with a Mr. Eden. The mill was located not far north of the old post office building beyond a house owned by Mrs. Bloomfield, his mother-in-law. A mill pond was located on the site. Eden ran a sawmill in Corrigan after he left Burke. Small sawmills sprang up wherever timber cutting was required. These small mills were referred to as "peckerwood" sawmills because they didn't cut wood much faster than a woodpecker. The author remembers a small sawmill on the property of C. B. Fairchild just south of the Angelina County airport. The mill cut hardwood, and there was a large pile of sawdust adjacent the mill. Sawdust piles were a great attraction to children, and the older ones were a great danger. After several years sawdust piles would start to burn internally from spontaneous combustion. Anyone climbing on the pile could fall through to a fiery death. The author recalls a sawdust pile just north of Angelina County Airport that smolderd for years. The Fairchild family must have been involved in the early sawmills. Not only did C. B. Fairchild have a mill near his farm as mentioned above, but his brother I. D. Fairchild, a Burke native who became a sucessful Lufkin lawyer and later State Senator, owned a sawmill at Retrieve, southwest of Huntington from 1905-1908 and perhaps one at Fairchild Switch, which is now known as Hoshall, about 1913. This may have been the predecessor to the Wright Lumber Company at Hoshall. It is interesting to note that the burning sawdust pile mentioned above was on property adjacent a farm owned by I. D.'s widow, suggesting that he may have had a connection with that mill also. The sawmill that had the greatest influence on Burke was not in Burke. It was the one owned by the Temple family four miles south at Diboll. This very large mill then known as Southern Pine Lumber Company and now as Temple-Eastex has employed several generations of Burke residents. The mill whistles calling the employees to work in the morning and informing them of lunch break and quitting time were easily heard in Burke. The author's father worked at a box factory associated with the sawmill during the early stages of World War II. Another mill that employed some Burke residents was the Wright Lumber Company at Hoshall. One of those employees was the author's grandfather, Virgil Murrah. The photograph at the top of this page is believed to be of the Hoshall mill. The Handbook of Texas, "Burke"